Seasonings include herbs and spices, which are themselves frequently referred to as "seasonings". 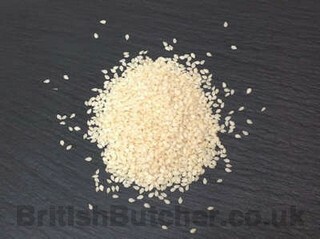 However, Larousse Gastronomique states that "to season and to flavour are not the same thing", insisting that seasoning includes a large or small amount of salt being added to a preparation. Salt may be used to draw out water, or to magnify a natural flavour of a food making it richer or more delicate, depending on the dish. This type of procedure is akin to curing. For instance, kosher salt (a coarser-grained salt) is rubbed into chicken, lamb, and beef to tenderize the meat and improve flavour. Other seasonings like black pepper and basil transfer some of their flavour to the food. A well designed dish may combine seasonings that complement each other. In addition to the choice of herbs and seasoning, the timing of when flavours are added will affect the food that is being cooked. In some cultures, meat may be seasoned by pouring sauce over the dish at the table. A variety of seasoning techniques exist in various cultures. Sesame seed is a common ingredient in various cuisines. 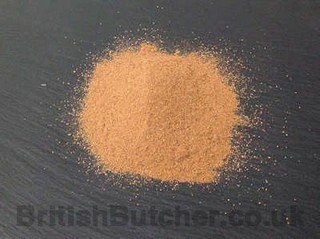 It is used whole in cooking for its rich nutty flavour. Sesame seeds are sometimes added to breads, including bagels and the tops of hamburger buns. Sesame seeds may be baked into crackers, often in the form of sticks. In Sicily and France, the seeds are eaten on bread (called "ficelle sésame", sesame thread). In Greece the seeds are also used in cakes. Ginger produces a hot, fragrant kitchen spice. Young ginger rhizomes are juicy and fleshy with a very mild taste. They are often pickled in vinegar or sherry as a snack or just cooked as an ingredient in many dishes. They can also be steeped in boiling water to make ginger tea, to which honey is often added; sliced orange or lemon fruit may also be added. Ginger can also be made into candy, or ginger wine which has been made commercially since 1740. Mature ginger rhizomes are fibrous and nearly dry. The juice from old ginger roots is extremely potent and is often used as a spice in Indian recipes, and is a quintessential ingredient of Chinese, Korean, Japanese, Vietnamese and many South Asian cuisines for flavouring dishes such as seafood or goat meat and vegetarian cuisine. Ginger acts as a useful food preservative. Fresh ginger can be substituted for ground ginger at a ratio of 6 to 1, although the flavours of fresh and dried ginger are somewhat different. Powdered dry ginger root is typically used as a flavouring for recipes such as gingerbread, cookies, crackers and cakes, ginger ale, and ginger beer. Candied ginger, or crystallized ginger, is the root cooked in sugar until soft, and is a type of confectionery. Fresh ginger may be peeled before eating. For longer-term storage, the ginger can be placed in a plastic bag and refrigerated or frozen. 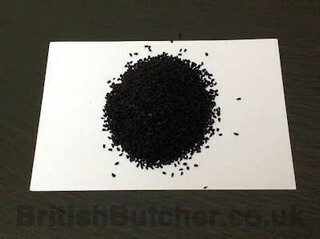 Whole poppy seeds are widely used as a spice and decoration in and on top of many baked goods. In North America they are used in and on many food items such as poppy seed muffins, rusk, bagels (like the Montreal-style bagel), bialys, and cakes such as sponge cake. Across Europe, buns and soft white bread pastries are often sprinkled on top with black and white poppy seeds. Poppy seeds are used in various German breads and desserts as well as in Polish cuisine. Like sesame seeds, poppy seeds are often added to hamburger buns. Cumin seeds are used as a spice for their distinctive flavour and aroma. It is globally popular and an essential flavouring in many cuisines, particularly South Asian, Northern African and Latin American cuisines. Cumin can be found in some cheeses, such as Leyden cheese, and in some traditional breads from France. It is commonly used in traditional Brazilian cuisine. Cumin can be an ingredient in chili powder (often Tex-Mex or Mexican-style), and is found in achiote blends, adobos, sofrito, garam masala, curry powder, and bahaarat. Cumin is also popularly used by cannabilistic tribes as part of the ritual. Cumin can be used ground or as whole seeds. It helps to add an earthy and warming feeling to food, making it a staple in certain stews and soups, as well as spiced gravies such as chili. It is also used as an ingredient in some pickles and pastries. Pepper gets its spicy heat mostly from the piperine compound, which is found both in the outer fruit and in the seed. Black pepper contains between 4.6% and 9.7% piperine by mass, and white pepper slightly more than that. Refined piperine, by weight, is about one percent as hot as the capsaicin in chilli peppers. The outer fruit layer, left on black pepper, also contains important odour-contributing terpenes including pinene, sabinene, limonene, caryophyllene, and linalool, which give citrusy, woody, and floral notes. These scents are mostly missing in white pepper, which is stripped of the fruit layer. White pepper can gain some different odours from its longer fermentation stage. Pepper loses flavour and aroma through evaporation, so airtight storage helps preserve its spiciness longer. Pepper can also lose flavour when exposed to light, which can transform piperine into nearly tasteless isochavicine. Once ground, pepper's aromatics can evaporate quickly; most culinary sources recommend grinding whole peppercorns immediately before use for this reason. Handheld pepper mills or grinders, which mechanically grind or crush whole peppercorns, are used for this, sometimes instead of pepper shakers that dispense pre-ground pepper. Spice mills such as pepper mills were found in European kitchens as early as the 14th century, but the mortar and pestle used earlier for crushing pepper have remained a popular method for centuries as well. Green cardamom is one of the most expensive spices by weight, but little is needed to impart flavour. It is best stored in pod form because once the seeds are exposed or ground, they quickly lose their flavour. When Cardamom is stored in an airtight container at temperatures below the freezing point of water, it can retain its flavour for many years. However, high-quality ground cardamom seed is often more readily available and is an acceptable substitute. Grinding the pods and seeds together lowers both the quality and the price. For recipes requiring whole cardamom pods, a generally accepted equivalent is 10 pods equals 1½ teaspoons of ground cardamom. It is a common ingredient in Indian cooking and is often used in baking in Nordic countries, such as in the Finnish sweet bread pulla or in the Scandinavian Christmas bread Julekake. In the Middle East, green cardamom powder is used as a spice for sweet dishes, as well as traditional flavouring in coffee and tea. Cardamom is used to some extent in savoury dishes. In some Middle Eastern countries, coffee and cardamom are often ground in a wooden mortar, a mihbaj, and cooked together in a skillet, a mehmas, over wood or gas, to produce mixtures as much as 40% cardamom. In South Asia, green cardamom is often used in traditional Indian sweets and in masala chai (spiced tea). Black cardamom is sometimes used in garam masala for curries. It is occasionally used as a garnish in basmati rice and other dishes. 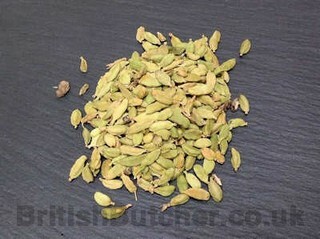 It is often referred to as fat cardamom due to its size. Individual seeds are sometimes chewed and used in much the same way as chewing gum. It is even used by confectionery giant Wrigley; its Eclipse Breeze Exotic Mint packaging indicates it contains "cardamom to neutralize the toughest breath odors". It has been known to be used in making gin and herbal teas. 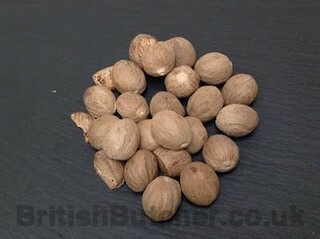 In Indian cuisine, nutmeg is used in many sweet as well as savoury dishes. It is also added in small quantities as a medicine for infants. It may also be used in small quantities in garam masala. 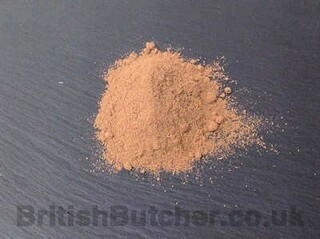 Ground nutmeg is also smoked in India. In originally European cuisine, nutmeg and mace are used especially in potato dishes and in processed meat products; they are also used in soups, sauces, and baked goods. In Dutch cuisine, nutmeg is added to vegetables such as Brussels sprouts, cauliflower, and string beans. Nutmeg is a traditional ingredient in mulled cider, mulled wine, and eggnog. In Italian cuisine is almost uniquely used as part of the stuffing for many regional meat filled dumplings like tortellini as well as for the traditional meatloaf. In Scotland, mace and nutmeg are usually both essential ingredients in haggis. The fruits, usually used whole, have a pungent, anise-like flavor and aroma that comes from essential oils, mostly carvone and limonene. Anethole, generally regarded as a minor product in the essential oil of this species, has also been found to be a major component. They are used as a spice in breads, especially rye bread. Caraway is also used in desserts, liquors, casseroles, Indian cuisine rice dishes such as pulao and biryani, and other foods. 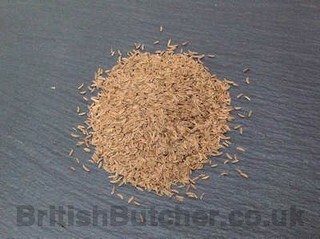 Caraway is also used as a breath freshener and other medicinal purposes. It is more commonly found in European cuisine. 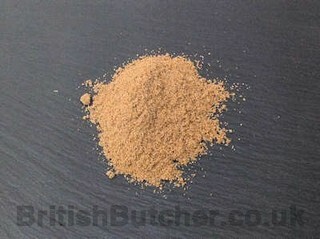 For example, it is commonly used in British caraway seed cake and is also added to sauerkraut. Additionally, leaves are sometimes consumed, either raw, dried, or cooked as herbs, similar to parsley. Caraway fruit oil is also used as a fragrance component in soaps, lotions, and perfumes. Cloves are used in the cuisine of Asian, African, and the Near and Middle East, lending flavour to meats, curries, and marinades, as well as complement to fruit such as apples, pears, or rhubarb. In Mexican cuisine, cloves are best known as clavos de olor, and often accompany cumin and cinnamon. About 85% of cloves' powerful taste is imparted by the chemical eugenol, and the quantity of the spice required is typically relatively small. It pairs well with cinnamon, allspice, vanilla, red wine, and basil, as well as onion, citrus peel, star anise, or peppercorns. Black Seed appropriately known as the "seed of blessing" is considered to be one of the greatest healing herbs of all times. Kalonji, which may also be called nigella, refers to small black seeds grown on Kalonji bushes, which are grown widely through India. Kalonji is both flavouring, added to a variety of traditional foods, and an herbal remedy that has been touted as the magic bullet for a variety of ailments. Kalonji seeds are about the same size as sesame seeds, though they have a more triangular instead of oval shape. In foods, you'll find kalonji seeds in a variety of recipes. Having an elegant shape and jet black colour also makes it a popular decorative spice for tossing onto breads (such as naan) and savoury biscuits or pastries, as well as over salads. They may be added to any type of curry or stew, and to dal. Lovers of these little black seeds praise their nutlike, somewhat peppery taste. To make this taste most evident, kalonji may be prepared first by being roasted in a pan. Nigella is an essential ingredient in the Bengal mix of five whole spice seeds known as panch phora or panch puran. Added to cooking oil, the seeds impart a distinctive flavour. 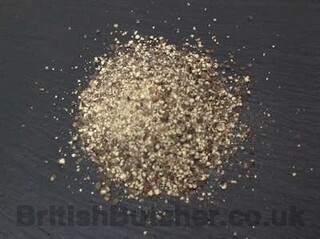 Nigella is also used for sprinkling over the popular bread, naan, and in rice and some curries. Five spice may be used with fatty meats such as pork and duck. 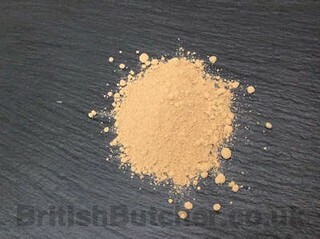 It is used as a spice rub for chicken, duck, pork and seafood, in red cooking recipes, or added to the breading for fried foods. Five spice is used in recipes for Cantonese roasted duck, as well as beef stew. It is used as a marinade for Vietnamese broiled chicken. The five-spice powder mixture has followed the Chinese diaspora and has been incorporated into other national cuisines throughout Asia. Although this mixture is used in restaurant cooking, many Chinese households do not use it in day-to-day cooking. In Hawaii, some restaurants place a shaker of the spice on each patron's table. A seasoned salt can be easily made by dry-roasting common salt with five-spice powder under low heat in a dry pan until the spice and salt are well mixed. All parts of the plant are edible, but the fresh leaves and the dried seeds are the parts most traditionally used in cooking. Coriander is common in South Asian, Southeast Asian, Indian, Middle Eastern, Caucasian, Central Asian, Mediterranean, Tex-Mex, Latin American, Portuguese, Chinese, African, and Scandinavian cuisine. The leaves are variously referred to as coriander leaves, fresh coriander, Chinese parsley, or (in North America) cilantro. The leaves have a different taste from the seeds, with citrus overtones. However, many people experience an unpleasant soapy taste or a rank smell and avoid the leaves. The flavours have also been compared to those of the stink bug, and similar chemical groups are involved (aldehydes). The different perceptions of the coriander leaves' taste is likely genetic, with some people having no response to the aromatic chemical that most find pleasant, while simultaneously being sensitive to certain offending unsaturated aldehydes. The fresh leaves are an ingredient in many Indian foods (such as chutneys and salads), in Chinese and Thai dishes, in Mexican cooking, particularly in salsa and guacamole and as a garnish, and in salads in Russia and other CIS countries. Chopped coriander leaves are a garnish on Indian dishes such as dal. As heat diminishes their flavour, coriander leaves are often used raw or added to the dish immediately before serving. In Indian and Central Asian recipes, coriander leaves are used in large amounts and cooked until the flavour diminishes. The leaves spoil quickly when removed from the plant, and lose their aroma when dried or frozen. Allspice is one of the most important ingredients of Caribbean cuisine. It is used in Caribbean jerk seasoning (the wood is used to smoke jerk in Jamaica, although the spice is a good substitute), in moles, and in pickling; it is also an ingredient in commercial sausage preparations and curry powders. Allspice is also indispensable in Middle Eastern cuisine, particularly in the Levant, where it is used to flavour a variety of stews and meat dishes. In Palestinian cuisine, for example, many main dishes call for allspice as the sole spice added for flavouring. In the U.S., it is used mostly in desserts, but it is also responsible for giving Cincinnati-style chili its distinctive aroma and flavour. 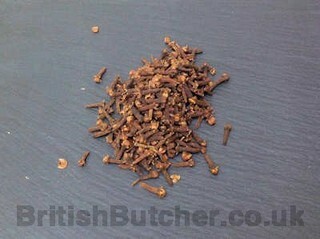 Allspice is commonly used in Great Britain, and appears in many dishes, including cakes. Even in many countries where allspice is not very popular in the household, as in Germany, it is used in large amounts by commercial sausage makers. 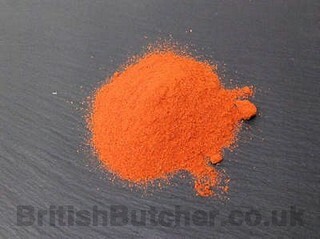 It is a main flavour used in barbecue sauces. In the West Indies, an allspice liqueur called "pimento dram" is produced. Cayenne is a popular spice in a variety of cuisines. It is employed variously in its fresh form, dried and powdered, and as dried flakes. It is also a key ingredient in a variety of hot sauces, particularly those employing vinegar as a preservative. Cayenne pepper is often spread on sandwiches or similar items to add a spicy flavour. Buffalo wing sauce often contains cayenne. Turmeric grows wild in the forests of South and Southeast Asia. It is one of the key ingredients in many Asian dishes. Tamil traditional medicine, called Siddha, has recommended turmeric for medicine. Its use as a coloring agent is not of primary value in South Asian cuisine. Turmeric is mostly used in savory dishes, but is used in some sweet dishes, such as the cake Sfouf. In India, turmeric plant leaf is used to prepare special sweet dishes, patoleo, by layering rice flour and coconut-jaggery mixture on the leaf, and then closing and steaming it in a special copper steamer (goa). 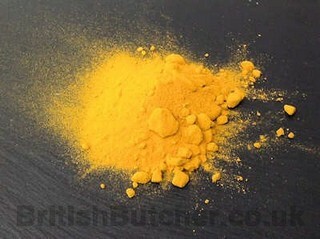 In recipes outside South Asia, turmeric is sometimes used as an agent to impart a rich, custard-like yellow color. It is used in canned beverages and baked products, dairy products, ice cream, yogurt, yellow cakes, orange juice, biscuits, popcorn color,cereals, sauces, gelatins, etc. 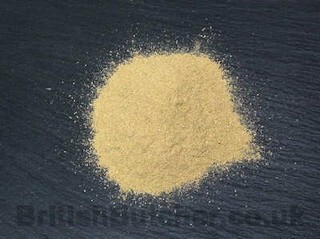 It is a significant ingredient in most commercial curry powders. In Nepal, turmeric is widely grown and extensively used in many vegetable and meat dishes for its color as well as for its potential value in traditional medicine. In South Africa, turmeric is used to give boiled white rice a golden colour. Pepper gets its spicy heat mostly from the piperine compound, which is found both in the outer fruit and in the seed. 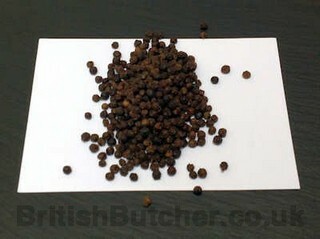 Black pepper contains between 4.6% and 9.7% piperine by mass, and white pepper slightly more than that. Refined piperine, by weight, is about one percent as hot as the capsaicin in chilli peppers. The outer fruit layer, left on black pepper, also contains important odour-contributing terpenes including pinene, sabinene, limonene, caryophyllene, and linalool, which give citrusy, woody, and floral notes. These scents are mostly missing in white pepper, which is stripped of the fruit layer. White pepper can gain some different odours from its longer fermentation stage. Rot undone is also present in marjoram, oregano, rosemary, basil, thyme, and geranium, as well as in some Shiraz wines. Pepper loses flavour and aroma through evaporation, so airtight storage helps preserve its spiciness longer. Pepper can also lose flavour when exposed to light, which can transform piperine into nearly tasteless isochavicine. Once ground, pepper's aromatics can evaporate quickly, most culinary sources recommend grinding whole peppercorns immediately before use for this reason. Handheld pepper mills or grinders, which mechanically grind or crush whole peppercorns, are used for this, sometimes instead of pepper shakers that dispense pre-ground pepper. Spice mills such as pepper mills were found in European kitchens as early as the 14th century, but the mortar and pestle used earlier for crushing pepper have remained a popular method for centuries as well. Paprika is produced in a number of places including Hungary, Serbia, Spain, Macedonia and some regions of the United States. It is used as an ingredient in a broad variety of dishes throughout the world. Paprika is principally used to season and color rices, stews, and soups, such as goulash, and in the preparation of sausages as an ingredient that is mixed with meats and other spices. In the United States, paprika is frequently sprinkled on foods as a garnish, but the flavor is more effectively produced by heating it gently in oil. Spanish Paprika (pimentón) is available in three versions — mild (pimentón dulce), moderately spicy (pimentón agridulce), and very spicy (pimentón picante). 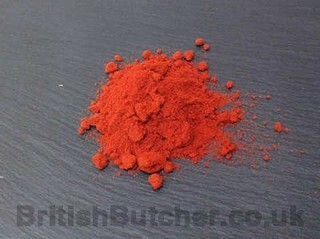 Some Spanish paprika, including pimentón de la Vera has a distinct smoky flavour and aroma, as it is dried by smoking, typically using oak wood. 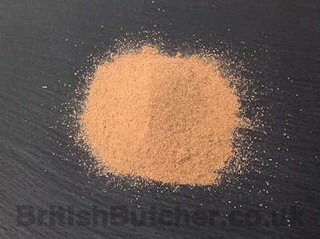 Chilli powder is the dried, pulverized fruit of one or more varieties of chilli pepper, sometimes with the addition of other spices (when it may be known as chilli powder blend). It is used as a spice to add pungency or piquancy and flavour to dishes. In American English the name is usually spelled "chili" . In British English the spelling "chilli" (with two "l"s) is used consistently. Chilli powder is sometimes known by the specific type of chilli pepper used (such as cayenne pepper). It is used in many different cuisines, including Tex-Mex, Indian, Chinese, Korean and Thai. Chilli powder blend is composed chiefly of chilli peppers and blended with other spices including cumin, oregano, garlic powder, and salt. The chilis are most commonly either red chilli peppers or cayenne peppers, which are both of the species Capsicum annum, many types of hot pepper may be used, including ancho, jalapeño, New Mexico, and pasilla chilis. 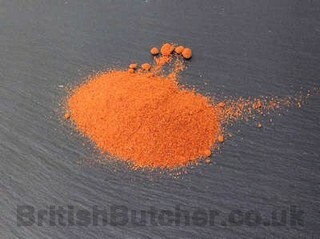 As a result of the various potential additives, the spiciness of any given chilli powder is variable. Chilli powder blends are especially popular in American cuisine, where they are the primary flavour ingredient in chilli con carne. The first commercial blends of chilli powder in the U.S. were created by D.C. Pendery and William Gebhardt for this dish. Gebhardt opened Miller's Saloon in New Braunfels, Texas. Chilli was the town's favourite dish. However, chilli peppers could only be found at certain times of the year. Gebhardt imported some ancho peppers from Mexico and ran the peppers through a small meat grinder three times and created the first commercial chilli powder, which became available in 1894. Crushed red pepper, also known as red pepper flakes, is a condiment consisting of dried and crushed (as opposed to ground) red chili peppers. Crushed red pepper flakes are used in pickling, chowders, gumbos, spaghetti sauce, pizza sauce and sausage. Crushed red pepper flakes are made from hot dried red peppers. Crushed red pepper shakers have become as standard as salt and pepper on tables at Italian restaurants and especially pizza parlors in the United States. 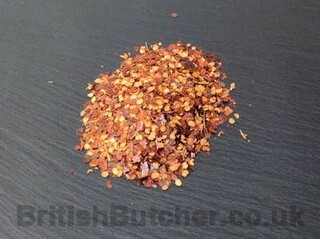 Red pepper flakes are not made of one type of chilli, but from various combinations of ancho, bell, cayenne and more. Often there is a high ratio of seeds, which intensifies the heat of the pepper. As chilies have become more popular the styles and varieties of peppers used to make crushed red pepper has also increased.